Balls and Whistles: Is XLV the Last of the Small Market Match Ups? subsidizing the market. That will stop. Jones has said, basically, that he'd like to see both the salary cap and revenue sharing eliminated from the NFL. 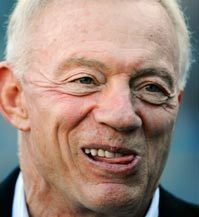 In Jerry World, it's all Jerry, all the time. Take away revenue sharing and the salary cap? All of a sudden, the Green Bay Packers, one of the most legendary franchises in the history of football, become the Kansas City Royals. Meanwhile, the most decorated franchise in the entire league, the Pittsburgh Steelers, could end up as relevant as the Pittsburgh Pirates. Take away the salary cap and revenue sharing and you've just turned football ... into baseball. Which means that an owner like Jerr'Jones could simply buy championships. Perhaps they could even play those championship games at his own Deathstar, a facility Pat Summerall appropriately referred to as Jerry Jones' "monument to himself." World + the history of the NFL < Jerr'Jones. What makes the league great is a Super Bowl like XLV because it means hope. Hope for any fan of any franchise, that his or her team will draft well, hire competent scouts and coaches, and make smart free agency moves. If all that works out, and you get a bit lucky, your team can end up here, in the Super Bowl. Dare I say it, its as close to a meritocracy as you'll find. That's the beauty of the NFL. It wasn't all that long ago that the NFL was not the cash cow we know today. Back in the 1930's and 1940's, and even the 1950's, owners didn't make much profit. They made a decent buck, but nothing like the astronomical figures bandied about today. Back then, some teams considered it a good year if they broke even, most teams made profits in the single digits; two and three and four percent profit margins were common and ten percent profit was a ridiculous windfall. It wasn't until the 1960's that the sport really started to take off, to make some serious money. Commissioner Pete Rozzelle (rightly) convinced the owners that they would all make more money if the league in total was strong top to bottom, not just a few teams at the top. What that ushered in was opportunity. It's this opportunity, this genuine hope that every fan of just about every team has from draft day through training camp to the opening games, that makes the NFL great, that makes it must see TV. If Jones (and a few other Richy Rich owners) have their way, the amazing, forward thinking structure of the NFL, pioneered by guys like Lamar Hunt, Wellington Mara and Pete Rozzelle can all be undone by greed gone wild. Not to put too fine a point on it, but Jerr'Jones isn't fit to hold Wellington Mara's spit cup. The NFL works because you can have Super Bowl XLV, pitting Green Bay, Wisconsin (Population 101,000-ish) versus Pittsburgh, Pennsylvania (urban population 300,000ish). So enjoy tonight's Super Bowl. Enjoy seeing two historical, small-market teams battle it out, ironically, at Jerry World. Enjoy it while you can. And hope that cooler, more visionary owners prevail over Jones in the off-season.